Primitive Inks in ancient – and not so ancient times. It is likely that the very first tattoos happened by accident. Maybe someone was stabbed or pricked with a burnt stick which broke the surface of the skin and drew blood. The soot from the stick would then become lodged under the skin and later, after the wound healed – hey presto – primitive man’s first tattoo. Early tattoos were generally limited to one color – black, which was nearly always made from soot, but once people saw how the soot worked, budding tattooists in different cultures around the world started experimenting with other ingredients they had to hand. Early tattooists started to create their own inks, which were often accompanied with tribal ceremonies and the making of the ink could be very time-consuming. Crushed flowers, mud, dirt, human or animal blood, and other natural elements found in around their habitat would be mixed with water to create the earliest inks. The ancient Romans had a tattoo ink recipe that consisted of pine bark mixed with corroded bronze, vinegar, insect egg deposits and iron sulfate. All this was then mixed with water and leek juice. The process was quite complex and must have been the result of much trial and error and clearly took a long time to prepare. Over in Samoa, black ink was created by using oily nuts from a native Samoan tree and burning them in a fire with half a coconut shell underneath to gather the soot. The ink maker then added sea water to the soot. Even to this day, many traditional Samoan Tattooists make their own inks. In New Guinea, they would burn branches from a local tree which produced a powder to be used as a tattoo. Three hundred years ago the Japanese are credited with making some of the first colored inks by using cadmium, ferric oxide, and phthalocyanines – a group of synthetic green and blue organic dyes made from aromatic macrocyclic compounds. Other cultures used colored sands, rust and all manner of other sources to create home-made colors. Some of the most resourceful ink makers reside in the world’s prisons. The bindings on bibles were often crushed down to use as material to make soot. Other inmates spent countless hours grinding down bricks between two spoons to create a powder which was then mixed with water. A modern day method of making soot behind bars is to soak cotton balls in baby oil, Vaseline or some other petroleum-based substance, place it on a metal sheet, and set fire to it. The resultant soot is then scraped off with a card and mixed with a few drops of water to make tattoo prison ink. One thing we can say about all the old methods of making ink by hand is that there was total ignorance about which of these crude inks were safe and whether any of the ingredients had harmful side effects. Over the past three or four decades, the safe manufacture of tattoo inks has become much more sophisticated. These days, most responsible and ethical tattoo studios, such as All Day Tattoo in Bangkok obtain their inks from the safest and most reputable tattoo ink manufacturers. Modern ink manufacturers in the west, ensure that their inks are non-toxic, and many inks made today are organic and even vegan-friendly. Health risks are minimized by sterilizing them against a wide range of bacteria. Contemporary inks consist of two main constituents – the carrier and the pigment. Pigments can be made of almost any ingredient which, when ground into a fine powder, produces a specific color. Examples of commonly used pigment ingredients are minerals, vegetable-based dyes, mineral salts, and plastic-based pigments. Black inks are often made from carbon, white inks from zinc oxide, blue inks from calcium copper silicate, red inks from iron oxide, green inks from chromium oxide and yellow inks for curcuma, (a tropical Asian plant used for dyes). The carrier is a solvent for the pigment and as the name suggest, it carries and spreads the pigment across the dermis (the under-layer of skin) and keeps it uniformly mixed and free from harmful pathogens. Typical carrier ingredients include, ethyl alcohol, methylated spirit, methanol, rubbing alcohol, propylene glycol, and glycerin, witch hazel, purified water, propylene glycol, and even vodka is sometimes used. Of course, many of the above basic inks are thinned and mixed together to provide a broad range of colors and shades. The two main forms of ink that are used today are either organic or acrylic. Again, as the names suggest, organic inks contain only organic pigments, and acrylic inks contain synthetic pigments. Organic inks are said to be safer but they sometimes appear faded, whereas acrylic inks tend to be brighter and bolder. Favorites at parties and clubs, the former retains light and glows in darkened conditions and the latter gives off a fluorescent effect when a ‘blacklight’ (Ultra Violet) is switched on. ALL DAY Tattoo are one of the exclusive carriers in Thailand of imported UV inks from the USA. “Black Henna” ink, containing para-phenylenediamine (PPD) (which is used in hair dyes), or the healthier, fruit-based “Jagua” ink are sometimes applied to the surface of the skin to provide a temporary tattoo which can easily be removed. All Day Tattoo in Bangkok – which inks do they use? At All Day Tattoo in Bangkok, we use one of the world’s most prestigious tattoo inks, namely Eternal Ink, which is manufactured in the USA. Eternal Ink is a brand that has been tested and used by tattoo artists around the world. In recent years, Eternal has set the standard for product consistency, quality ingredients, and stunning results. The quality and consistency of their ink is controlled at every step of the way. The ink produced in one batch will exactly match the colors used in a subsequent batch, guaranteeing that all your tattoos will have consistent colors. 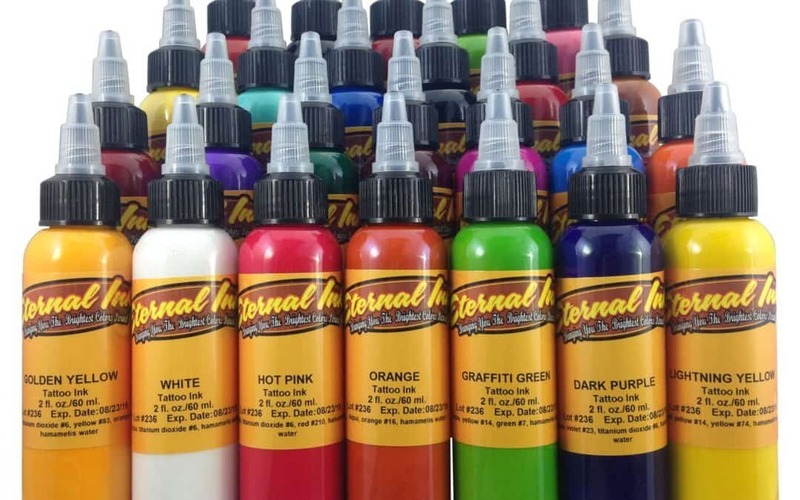 Eternal Ink was founded by the American, Terry Welker, who opened a chain of five Tattoo shops in the 1990s, (Eternal Tattoos), and in 1998 he created his own wide range of palette colors. This was a major advance from earlier inks when tattooists only had the choice of some 12 basic colors. In 2004 Welker launched Eternal Ink Inc. and the company now supplies more than 200 different colors to studios throughout the world. All US tattoo ink manufacturers are required to undergo testing and produce a Material Safety Data Sheet (MSDS) for the inks they produce. Here is a summary of the tests for Eternal Ink. Emergency Overview: No known significant effects or critical hazards. Potential Health Affects: Eyes, Skin, and Ingestion show no know significant effects or critical hazards. Carcinogenic effects: No known significant effects or critical hazards. Mutagenic effects: No known significant effects or critical hazards. Teratogenicity/Reproductive toxicity: No known significant effects or critical hazards. In additional, all the inks that we use at ALL DAY Tattoo are VEGAN friendly. At All Day Tattoo in Bangkok, our aim is to provide a top quality service in a hygienic, friendly and comfortable environment, using the finest available equipment and materials. This means that we make no compromises on the ink we use. All our ink is imported from Eternal Ink, one of the very best US ink manufacturers and every bottle of ink is only used once. If you want to know more about the ink we use or any other aspect of the tattoo process, why not click on the button below for an absolutely obligation-free consultation with one of our expert artists.